The Parkhotel Golf Marianske Lazne is located in the heart of the spa region and is a good accommodation in Marianske Lazne. It offers access to the many historic sites of the town, including the Goethe and Muse sculpture, Spa Colonnade, and the Miniaturpark. It is also within reach of such lovely attractions as Caroline's Spring and the Singing Fountain too. The Parkhotel Golf Marianske Lazne is located at Zadub 580 which is roughly 20 miles from the Karlovy Vary International Airport. Each of the bedrooms in the Parkhotel Golf Marianske Lazne is outfitted with satellite TV, a minibar, a personal safe, direct dial phone service, high-speed Internet access, and a full-sized bathroom with tub. 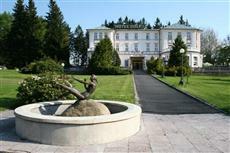 The Parkhotel Golf Marianske Lazne provides visitors with services and facilities including golf course access, private gardens and grounds, a spa with massage and beauty treatments, a swimming pool, a sauna, an in-house restaurant, a terrace, a lounge with bar service and a fireplace, a games room, 24-hour front desk service, airport transfers, a business service center, and free parking on the premises.